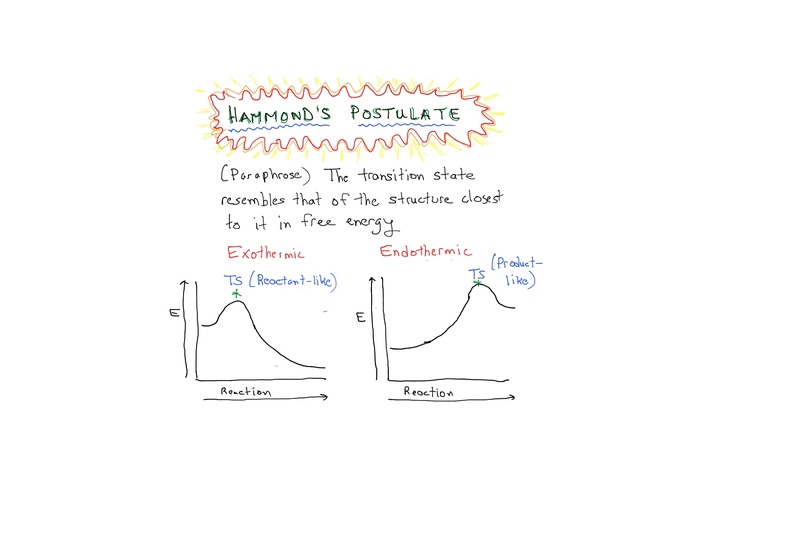 I recently had my first orgo exam and one of the concepts that I have trouble visceralizing is Hammond’s Postulate. I can follow the explanation in my textbook (L.G. Wade, Jr. 7th edition), but I don’t really grasp it. Is there an alternative intuitive explanation? The official explanation of Hammond’s Postulate is below, but here’s my one-sentence quick intuitive explanation of Hammond’s postulate: When drawing transition state diagrams, put the “hump” (i.e. the transition state) closest to the species highest in energy. You probably already do this, but it’s worth drawing out the “wrong” kind of transition state diagram to make it more clear. Let’s look at an exergonic reaction. In an exothermic exergonic reaction, the reactants are highest in energy. Therefore the transition state should be drawn closer to the reactant side. See how it doesn’t quite look right in the drawing on the left? Similarly, in an endothermic endergonic reaction, the product is the high-energy species. So the transition state should be drawn closer to the product side, not the reactant side. Let’s look at a concrete example: the conversion of an alkene to a carbocation by HCl. 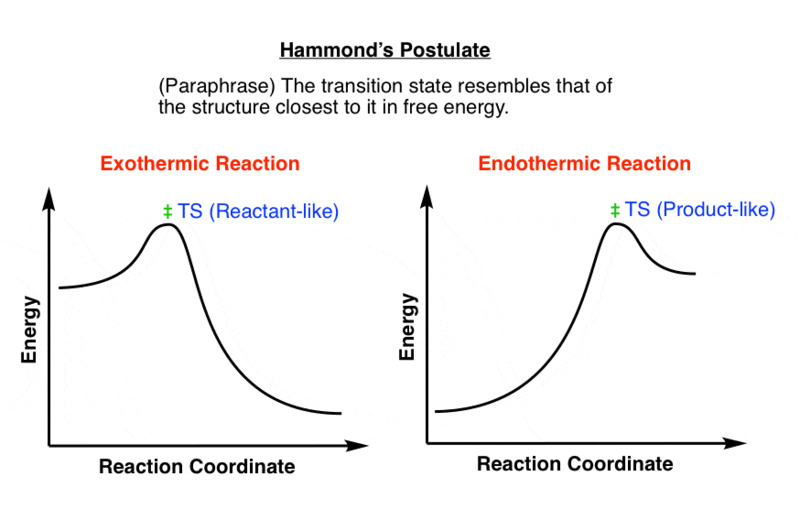 What Hammond’s postulate says is that the transition state will more closely resemble the product higher in energy. In this case, that’s the carbocation. 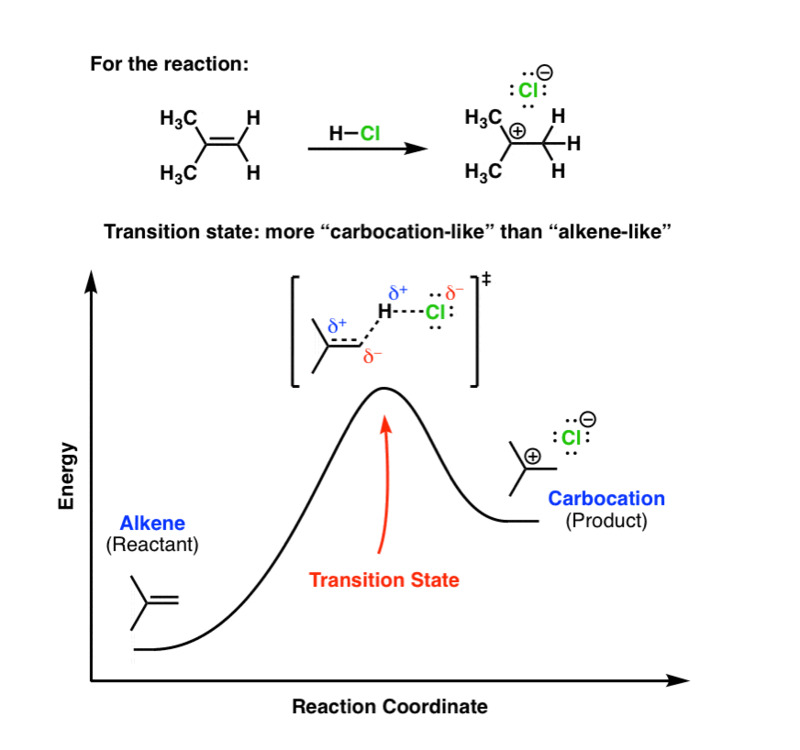 So the structure of the transition state more closely resembles the carbocation than the alkene. If two states, for example, a transition state and an unstable intermediate, occur consecutively during a reaction process and have nearly the same energy content, their interconversion will involve only a small reorganization of the molecular structures. The converse of this is that if two species occur consecutively and have a very different energy content, their interconversion will involve a large reorganization of their molecular structures. This also means that the transition state will resemble the species higher in energy. Here’s a different way of looking at it. This means that if you have a reaction that forms an unstable intermediate (such as a carbocation), the transition state for its formation will closely resemble that intermediate. One last question is what “the reaction coordinate” means. It’s meant to convey the progress of a reaction. In simple examples, the “reaction coordinate” can refer to a bond length, although as multiple molecular entities can get involved, the application is quite abstract. Think of it as “reaction progress”. I hope this answers your question, Diana! In the comments, Richard points out that I should have written “exergonic” not “exothermic”. Exergonic reaction: energy is released to the surroundings. The bonds being formed are stronger than the bonds being broken. An exothermic reaction is one where the energy released to the surroundings is heat energy. Most exergonic reactions are exothermic, but not all. For example in the chemiluminescent breakdown of firefly luciferin, energy is released to the surroundings as light. See here. could you please explain which kind of reactions do not follow hammond’s postulates.. Thank you man!!!! This explanation was of great help to me! I wish i had discovered this site when I was doing organic chemistry I.
will you please explain the applicability of Hammett Equation. That’s more of an advanced topic, for now I’d refer you to Ansyln’s Modern Physical Organic Chemistry for an excellent treatment of this topic. Bottom line: donor groups stabilize positively charged transition states (and accelerate rates) – acceptor groups stabilize negatively charged transition states. will you plz..explain..How Hammond’s postulate ableto explain the similarity of structure with the substrate and product? Excellent explaination, thank you for helping out. Don’t you mean exergonic rather than exothermic? Also, my understanding of the practical application of Hammond postulates that a compound that is thermodynamically unstable, breaks down easily is also kinetically unstable, reacts quickly. I think this is the same as what you wrote. Yes? Yes, I should have written exergonic. Thank you for the clarification. Re the second, I’d disagree. Thermodynamic stability does not necessarily correlate with kinetic instability. Human beings are “unstable” relative to our combustion with oxygen to give CO2 and H2O, but the activation barrier is quite high. However one could say that a reactive intermediate en route to combustion will be very similar to the transition state of the reaction itself. Could you explain how to determine which alkene forms carbocation faster in Hammonds postulate? What is the significance of the Hammond’s postulate? Would you be so kind to give an example, say, of proposed reaction mechanism, which is explicitly justified by Hammond’s postulate.